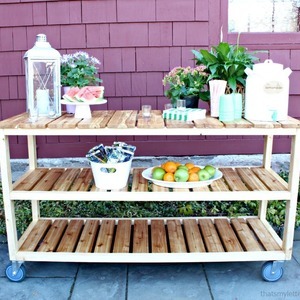 On the patio, deck or backyard this rolling console makes a very useful addition for outdoor entertaining. 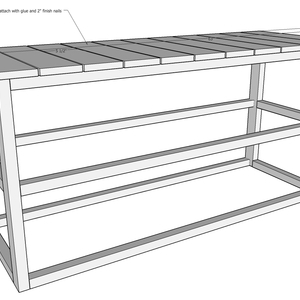 It has three large open shelves for food, drinks and extra storage. 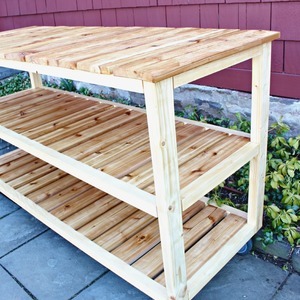 The open slat shelving is designed to let rain and moisture flow in between the boards making your rolling console outdoor friendly. In addition I used cedar wood for the shelf surfaces and sealed the entire console with exterior grade clear polyurethane. This rolling console is counter height and completely portable on casters so you can use it anywhere. Build frame short sides. Attach short frame sides to legs using pocket holes. 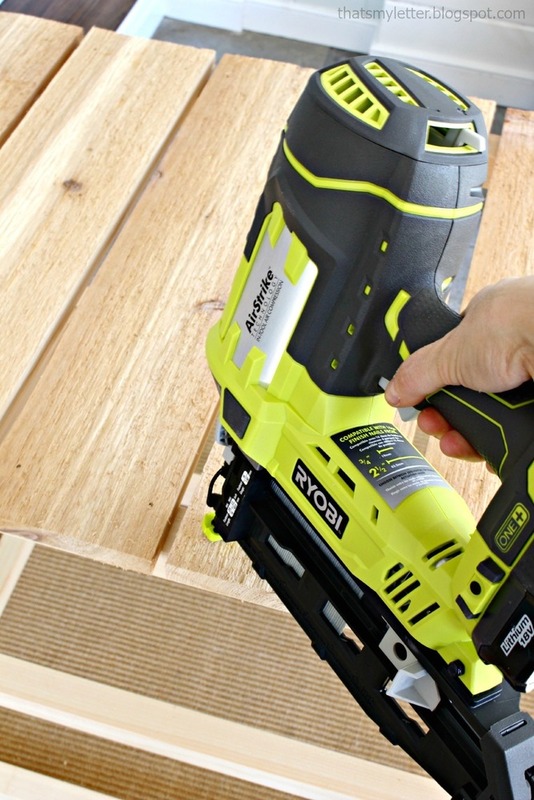 Use glue and 2 ½” pocket hole screws. Keep pocket holes to interior or underside. Make 2. Frame front/back. Attach long frame front and back pieces to legs using pocket holes. 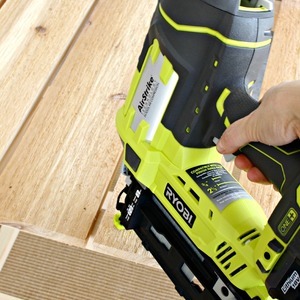 Use glue and 2 ½” pocket hole screws. Keep pocket holes to interior or underside. Frame complete. Top slats. 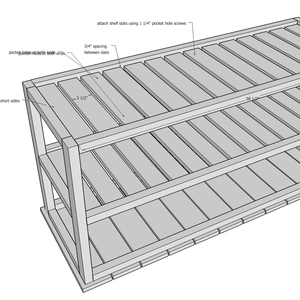 Attach top slats to frame. Glue and attach using 2” finish nails. Keep ¾” overhang at front, back and sides. At least two nails in each end of board. Middle shelf. 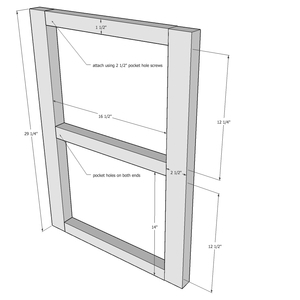 Attach shelf slats to frame. Keep slat flush to underside of 2x2 and attach using 1 ¼” pocket hole screws. Bottom shelf. Same as Step 4. 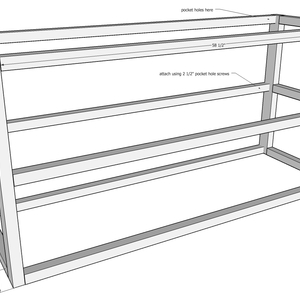 Attach shelf slats to frame. Keep slat flush to underside of 2x2 and attach using 1 ¼” pocket hole screws. Casters. 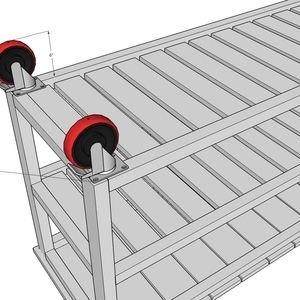 Attach 5” casters to bottom four corners using 1 ½” wood screws to fit casters. Use at least 2 casters with brakes on opposing corners. Sand well. Seal with exterior grade polyurethane. Looks great. I'm going to give it a try over the winter, but I'll use more affordable pine, and I'll need to cut it down to fit where I need it. On the patio, deck or backyard this rolling console makes a very useful addition for outdoor entertaining. 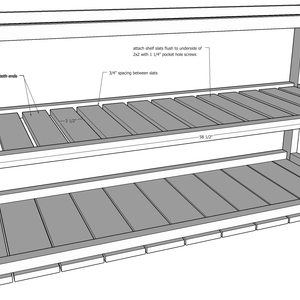 It has three large open shelves for food, drinks and extra storage. 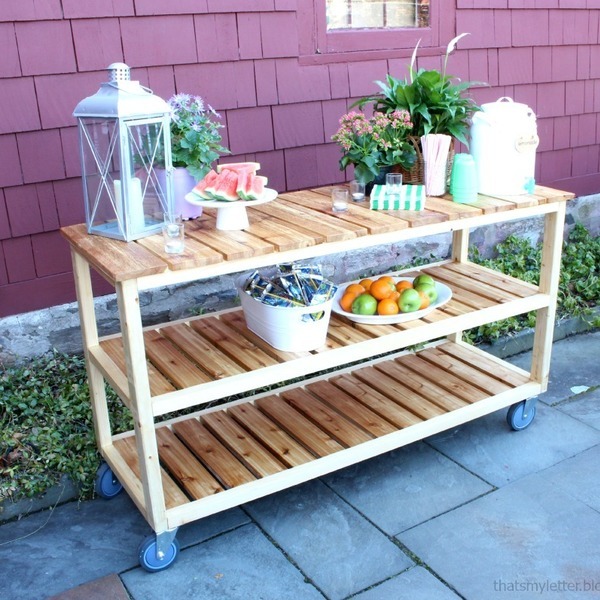 The open slat shelving is designed to let rain and moisture flow in between the boards making your rolling console outdoor friendly. 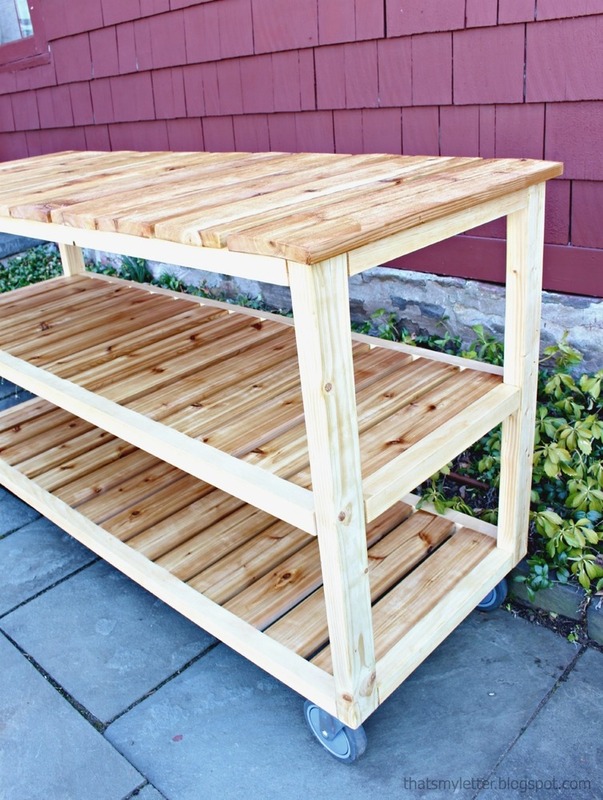 In addition I used cedar wood for the shelf surfaces and sealed the entire console with exterior grade clear polyurethane. 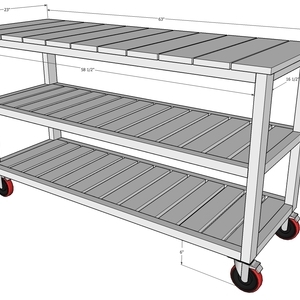 This rolling console is counter height and completely portable on casters so you can use it anywhere.